If you’ve had an online business for long, it’s likely that your hosting account is in a mess, and you probably don’t even know how bad it is. or clogged with tons of old emails. All of these things are chewing up your resources. A bloated hosting account is especially problematic on shared hosting, where you’re only allowed just so many files, disk space, and other resources. A messy account is a performance issue. It may also be a security risk. Plus, if your site every goes down or gets hacked, fixing or migrating it could cost a pretty penny to clean up under duress. Following are the messy account issues I see in site audits all the time. Like most online entrepreneurs, you’ve probably got a bunch of sites piled into one hosting account. That may have been okay back in the day as a good way to save money. It’s not any more. under a single hosting control panel are over. Every site is a security risk to every other site. Every site is chewing up limited resources. No site is getting a clean backup. Migration to new hosting is a mess. Sorting out which site is causing an issue is more difficult and costly. Performance and security tests are more difficult and costly. Do you own multiple domains? It’s likely you have, or had, a live site attached to them at one time. If you’ve abandoned that site and it’s still sitting on your hosting, without being updated, you’ve got a major security time bomb on your hands. Even if it’s not a WordPress site, it’s getting hit with bots and wasting your precious hosting resources. If it’s an add-on domain and you deleted the folder for it, you may still have orphaned databases on your account, including tables that some plugins made. And all of your host’s backups are including those unused sites, and that takes up even more of your hosting space. If you have a mailbox setup on your host, it may be full to the brim with old emails. Even if you use a local email client to pick them up, like Outlook or such, a copy of every email may still be sitting in your hosting account. Those old emails could be taking up a lot of space for nothing. You are only allowed 3000 inode connections on shared hosting. That means, 3000 files, no matter what they are. That includes all of your site files, the files created by plugins, emails, everything. I’ve helped one super prolific marketing client clean up 47 abandoned sites and tons of emails that were putting her inode connections in the red. We had to decrease her entire account size to something that could actually be migrated to a new host. She had no idea that her current hosting account was about to be shut down due to excessive overage on resources. Thank goodness we caught it in time. If you’re on shared hosting, and have cPanel, there’s a super easy way to check your resources. On the left you’ll see a sidebar with your stats. Be sure to click the link at the bottom of the sidebar to expand the section and see all of your stats. The first few resources shown in the image to the left are in real-time, meaning that they only display what is happening on your site at the time you are viewing them. I’ll show you how to get to a more detailed history in a moment. These include CPU and Memory Usage. The two most important stats to check here are your Disk Usage and your Inodes. If you’re near your limits, you’ve got a problem that needs to be addressed right away. 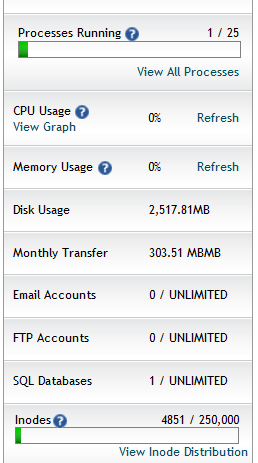 You can see a more detailed view of your CPU and Memory usage over time by going to the Logs section of your cPanel. Some hosts offer a Resource Usage interface, which is the icon at the end above. This lets you see your CPU and Memory usage, and if your site has been limited to resource overages. That’s VERY handy to know! Most all hosts who have cPanel also offer a way for you to check your Bandwidth. And in the Files section (not shown), you can also check your Disk Usage and see all of your files, including all of those folders with abandoned add-on domains, if you have them. There’s also a way for you to see all of your databases, but I would suggest you don’t go poking around in there unless you know what you’re doing. In the Mail section of cPanel (not shown) you’ll probably find an icon for Webmail. If you have your emails running through your hosting, it’s worth your while to jump in there and see if old copies are being stored. If so, clean them out. And don’t be shy about it if you’ve got local copies on your email client, like Outlook. You may want to back that up first, though. 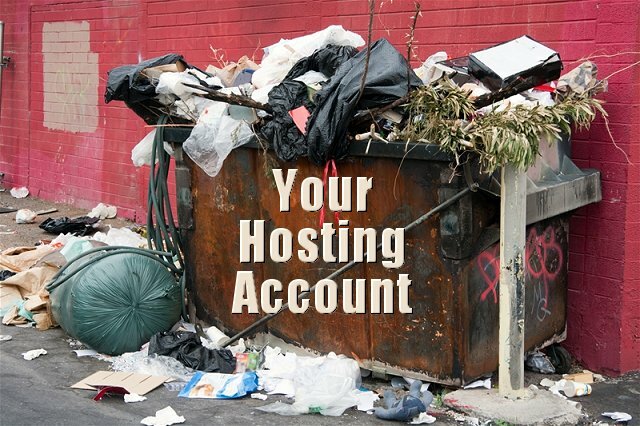 There are good and bad ways to clean up your hosting. This is where a qualified set of geek eyes on it can be a big help. The good news is, you can do a lot of it yourself once you’re shown what to check and how. If you’ve got multiple sites that will stay live, and you want to improve the security and performance, there are ways to split them into their own cPanels, and all still under the same hosting account. And, if you want to migrate to new hosting, it’s best to get your current account cleaned out to keep the backup as small as possible, to avoid any glitches or headaches. Ready for a site audit? It’s way more than just a check! You’ll get better performance, have a more secure site, and be able to keep your hosting all nice and clean yourself too.